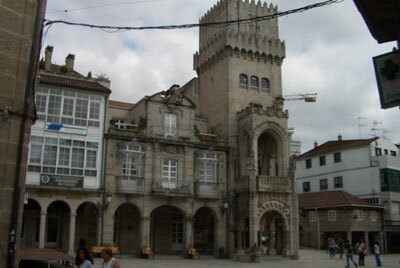 Porinno is a small town a few kilometres south of the city of Vigo. The areas spanning Vigo to Porrino are sometimes commercial and there are some industrial aspects to this part of Galicia, mainly because of the sea port connections with Vigo. The best parts of Porrino are in a pedestrianized part of the town that sees some older and character possessing buildings, including a small church, tucked away behind some trees. There is also an impressive council building with an almost castle like look to it. 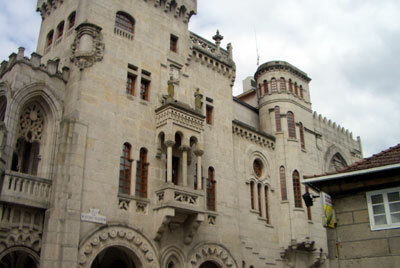 This building dominates the street in which it sits and has a regal appearnce. Porrino has a number of bars and cafes and there are some new and old colonnaded archways below the buildings lining part of the town centre. Porrino is certainly not one of Galicia's finest gems, but it does have a certain charm and there is some beautiful countryside and small rustic villages in the surrounding area. It is also ideally place between the likes of Vigo, Tui and even Portugal, so as a base or location for a holiday home it ticks plenty of boxes. Porrino is certainly not a town to place near the top of a sightseeing list, but it may be somewhere to take a break whilst on route to or from one of Galicia's more popular towns. Right, the main council building which has a grand appearance. 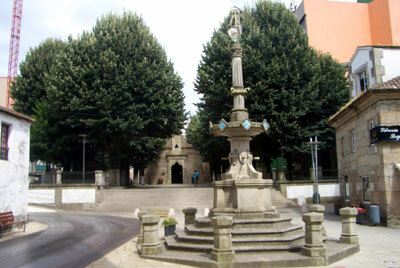 To the left is the small church that lies behind some trees at the entrance to the old town of Porrino.